Samhain, Dia de los Muertos, Halloween: This time of year, observers variously honor their ancestors and deities, or thumb their noses at the Grim Reaper while whistling through the graveyard. It’s during this season that the fading light reminds us how thinly separated are the worlds of the living and the dead. 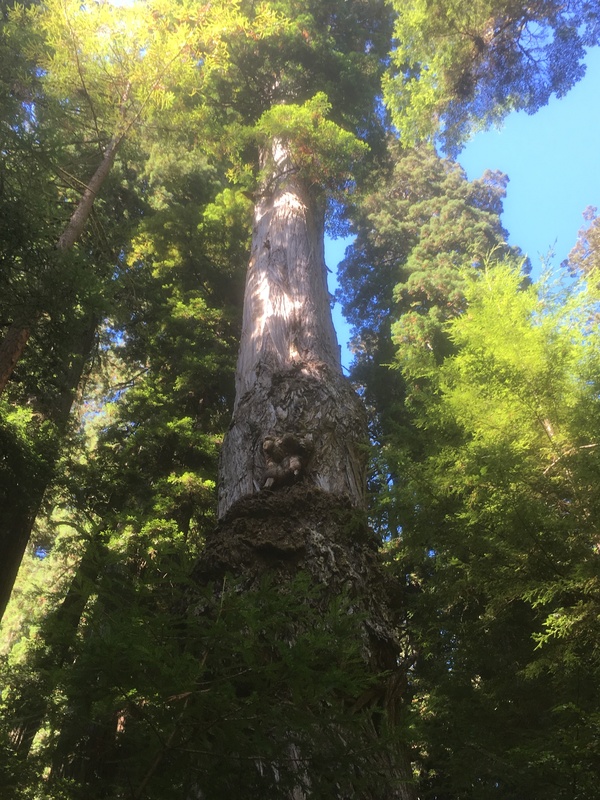 This October we visited Jedediah Smith and Prairie Creek, in northern California’s Redwood National and State Parks – places we hadn’t seen in 10 years. 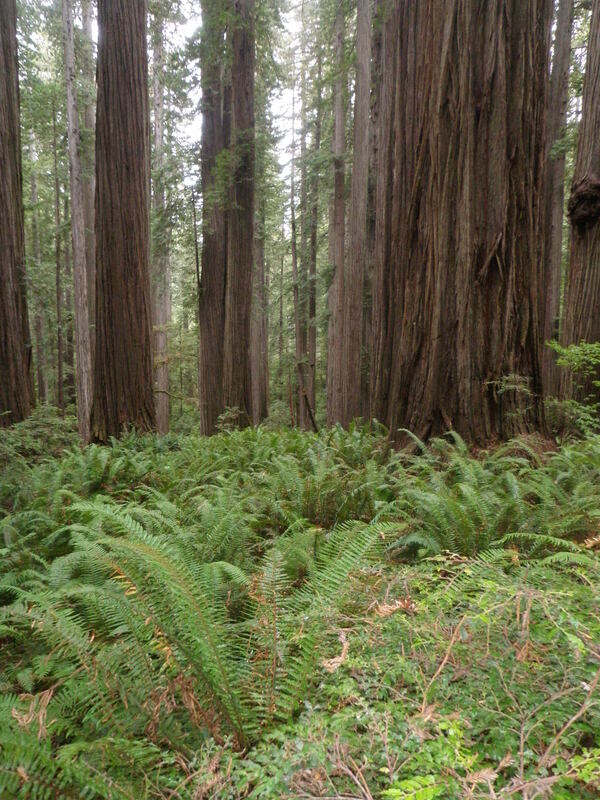 The coast redwoods or Sequoia sempervirens (“ever-living”), growing over 350 feet, are the tallest trees in the world. These ancient beings seem to breathe with the centuries – inhaling our carbon dioxide, and exhaling the purest, freshest air I’ve ever encountered. 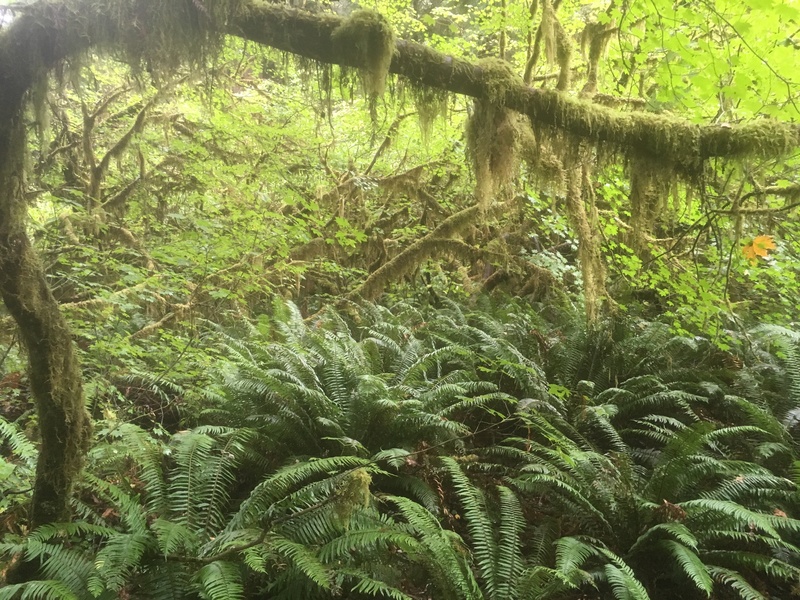 They also create their own climate: Thriving in the moist coastal environment, they trap fog in their needles and transpire that water back into the atmosphere, these amazing trees holding onto carbon even long after they die. The forest’s brilliant verdure is impossible to capture. Light rain of needles falling on us, gentle breath of giants eons old – seemingly timeless and ageless, they began in a primordial Eden, and may remain long after human folly ends. Shuffling through fall leaves, I’m spellbound as thoughts of my mother and aunt, both now gone, intermingle. 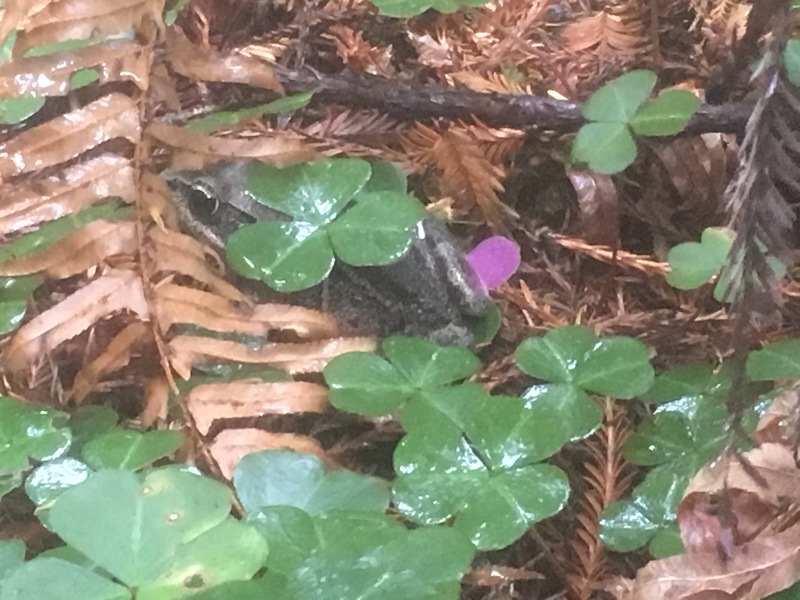 In these forests we saw salamanders, Steller’s jays, chipmunks, squirrels, deer, Roosevelt elk, even the endangered California red-legged frog. In our camp, two lovely foxes, surreptitiously seeking snacks in empty sites. How can such creatures exist, on the edge of wilderness, yet so nearby? The night before it poured, Prairie Creek rilling by. Our last evening, we sit by a warming fire ring, the night clear, with a scattering of stars. How is it that we live so separate from nature, that a fallen leaf seems miraculous, shafts of sunlight slanting through the trees a revelation? Maybe this is how nature renders the mundane extraordinary. Perhaps in this enchanted wood, I can find the sorcery to reunite with my beloved mother and aunt once again. This entry was posted in Family, Nature, Seasons, Uncategorized, Wildlife and tagged Day of the Dead, Hallowe'en, Nature, Redwoods, Samhain. Bookmark the permalink. A beautifully written piece. I always look forward to seeing you posts in my inbox! Thanks so much, I so appreciate your support – you’re always an inspiration! Lovely and inspiring. I do miss the redwoods. They will always be in my heart though. Thank you! Yes, such places have a way of lodging themselves within us, for sure. You have tremendous rainforests where you are now, which is its own beauty.